If you follow my facebook page, you know that I was out of my kitchen this past Sunday and was unable to share our weekly Sunday dinner. We were enjoying time with family up North, but I certainly didn't go empty handed. Like my mom's Chocolate Pound Cake, this is a treasured family recipe from my Great Aunt Margaret. We didn't have many sweets growing up (making up for that in my adult life), so when they did appear on the table or in the picnic basket, they were thoroughly enjoyed. 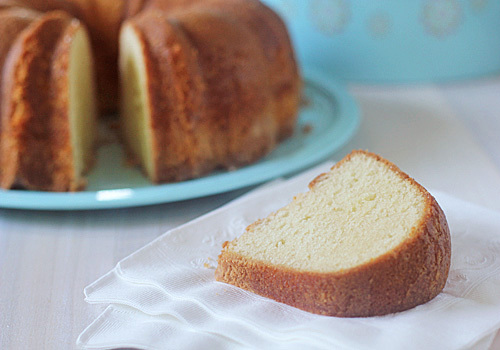 I have memories associated with just about every slice of pound cake I ate in my youth. 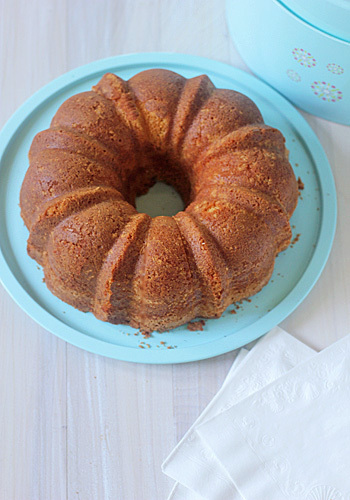 This is a pretty standard southern pound cake. You can taste the sweet, creamed butter, the floral essence of vanilla and the kiss of lemon, but then there is that something. It's that something you just can’t put your finger on. It rounds out all the flavors into one delicious slice of heaven. That secret ingredient is ground mace. What is ground mace you ask? It is the ground outer membrane of the nutmeg nut. It is warm and spicy like nutmeg, but more subtle in flavor and devoid of the little black flecks that nutmeg leaves behind. So please, if you do not have any ground mace, pick some up on your next trip to the market and make this cake! Then resist the urge to eat the cake on the day you make it (torture, I know). Trust me, letting it rest a day gives it that next day better goodness. Once it is completely cool, put it on your cake plate and cover with a dome or just wrap it in aluminum foil and walk away. OK, maybe steal one of those crispy, buttery crumbs that accidentally fell of the edge of the cake and then walk away. Grab a slice for breakfast with your morning coffee, steal a slice for an afternoon snack, or serve it as dessert with some berries and ice cream. Preheat oven to 325° F. Grease and flour bundt pan; set aside. In a medium bowl whisk together the flour, baking powder, salt, and mace; set aside. In the bowl of a stand mixer fitted with the paddle attachment cream the butter, shortening, and sugar until light and fluffy, about 3-5 minutes. Add the eggs one at a time, beating well after each addition. Using a rubber spatula, scrape down the sides of the bowl and mix again. Add the flour mixture in thirds alternating with the milk and ending with the flour. Add lemon and vanilla, scrape down the sides of the bowl, and mix until blended. Pour mixture evenly into the prepared bundt pan. Bake for 1 hour and 15 minutes to 1 hour and 30 minutes, or until a toothpick inserted in the middle comes out clean. Transfer the cake to a wire rack to cool for 10 minutes. Carefully invert the cake onto a wire rack to cool completely. Cake is always better the next day. Enjoy! wow this is such a beautiful cake! i've never heard of mace before but will be sure to be on the lookout for it on the next grocery store run :) i love new spices! I love a good pound cake! Not that it needs any adornement, but one thing that goes really well with the flaavor of mace or nutmeg is chocolate; a drizzle of chocolate glaze would out it right over the top. Since I can't get lemon extract here in Spain, can I either use lemon juice instead (And if so, how much?) Or double the vanilla extract? What do you think? I make your chocolate pound cake all the time so I am excited to make this one!! I would use 1 1/2 teaspoons of lemon zest to substitute the extract. Glad you like the chocolate version. Thanks Nicole!! I'm totally going to make this now. Keep these dessert recipes coming! !